LTPAC providers often admit and care for patients with incomplete information about their medical status. The literature review and environmental scan produced evidence that sharing and communicating information supports care coordination, particularly during transitions of care, and can reduce medication errors and other adverse events associated with preventable hospitalizations. Many interventions and tools to reduce preventable hospitalizations, including readmissions, incorporate best and promising practices that include the exchange of key information at the time of transitions and shared care. Much of the evidence on the benefits of HIE on care coordination is anecdotal and based on qualitative information. However, a few HIE interventions that involved exchange with LTPAC providers reported positive, quantitative (although not peer-reviewed and published) impacts of HIE including reduced rates of hospital admissions/readmissions, avoided transfers to emergency departments, and improved physician followup after hospital discharge. Other benefits reported as a result of implementing the interventions included more comprehensive and useful information for care planning and timely services delivery post-discharge, ensuring that important care and services that can prevent rehospitalization are provided soon after discharge. Study informants also reported that having access to information through HIE allowed them to better assess whether patients are suitable for their LTPAC services, plan for patient care before admission, better assess functional and cognitive status and risks (e.g., fall risk), and avoid unnecessary and duplicative tests and procedures. Barriers to adoption and use of HIT by LTPAC have been widely reported. This report discusses some of the more pervasive barriers including costs and limited resources for LTPAC providers to adopt and use HIT, certified electronic health record technology (CEHRT), and interoperable HIE. There is a general lack of awareness of HIE standards and interoperable HIE solutions and their value by LTPAC providers. Current standards in LTPAC electronic health record (EHR) solutions are generally outdated and do not support efficient interoperable HIE and information reuse. Even with available standards, LTPAC providers must often develop costly customized interfaces to participate in HIE. Other barriers and challenges are the differences in clinical processes and information needs between LTPAC/LTSS and other health care providers, which impacts agreement on and availability of key HIE information; a lack of LTPAC provider organizational commitment and capacity to acquire, implement, and use HIT including HIE; and high LTPAC staff turnover rates. In addition, privacy and security policies and requirements, while important to ensure secure HIE, pose barriers to LTPAC use of HIE. Some states' HIE policies restrict disclosure of protected health information for primary uses such as treatment only, which prevents LTPAC providers from accessing needed information before a treatment relationship has been established (e.g., for preadmission planning). 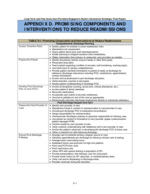 This study identifies and describes several payment policies and programs that support HIE with and by LTPAC/LTSS providers. These initiatives are discussed in this report and summarized below and include: HIT/EHR grant programs, health care service and payment reform models, the EHR Incentive Programs, EHR certification programs, and HIT standards that support HIE. Despite the demonstrated benefits of HIE, the use of EHR technology by LTPAC providers, including interoperable technology, appears to be lagging behind other sectors. LTPAC providers are not eligible for the Medicare and Medicaid EHR Incentive Programs and have lower rates of technology use in comparison to inpatient and ambulatory care settings. However, there has been some funding available to help LTPAC providers implement HIT such as EHRs and participate in electronic HIE. These include Office of the National Coordinator for Health Information Technology (ONC) grant funds to LTPAC providers and their affiliated health care delivery systems through the Challenge grants and Beacon Community grants, and the ONC State HIE Initiative, through which some states are providing assistance to to engage LTPAC providers in HIE. In addition, in three states the Medicare Quality Improvement Organizations are supporting LTPAC use of HIT to support medication management and care coordination in transitions of care, and advancing HIE. Most of the LTPAC providers identified as actively exchanging health information were recipients of these additional funds and other supports such as training, software, Internet access, and interfaces to an HIE organization (HIEO). Funding and programmatic initiatives and incentives such as those funded and authorized under the Patient Protection and Affordable Care Act (Affordable Care Act) promote and highlight the importance of care coordination around transitions and shared care. These incentives and initiatives include new federal, state, and private health care payment and delivery models such as Accountable Care Organizations and Patient-Centered Medical Homes, and other initiatives such as the Balancing Incentive Programs targeting LTSS providers and various programs implemented through the Administration for Community Living. Some of these initiatives are designed to reduce LTPAC transfers to hospitals, including readmissions. 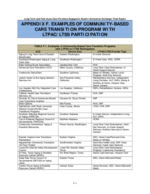 Many of the LTPAC HIE interventions identified in this study were participating in these initiatives. For example, the HHS Centers for Medicare and Medicaid Services (CMS) Innovations Models include the Community-based Care Transitions Program, which tests models for improving care transitions from the hospital to other settings and reducing readmissions for high-risk Medicare beneficiaries. The CCTP requires participation by community-based organizations such as LTSS. Some of the State Innovations Models also focus on care coordination and target LTPAC, and permit funding for the acquisition and use of HIT by these providers. The Health Information Technology for Economic and Clinical Health (HITECH) Act, enacted as part of the American Recovery and Reinvestment Act of 2009, advances the adoption and "meaningful use" (MU) of CEHRT including the interoperable exchange of health information.a This legislation was the foundation of the EHR Incentive Programs for eligible professionals, eligible hospitals, and critical access hospitals; the development of criteria for what constitutes the MU of EHRs; and the specification of EHR certification criteria and standards that must be integrated into CEHRT used by eligible providers in the EHR Incentive Programs. To receive EHR incentive payments, hospitals and physicians must use CEHRT. As EHR adoption and interoperability requirements continue to advance in the acute care and ambulatory care sectors, it will be increasingly important for LTPAC providers to adopt technology solutions that have the capability of exchanging standardized clinical data with care partners such as hospitals, primary care practitioners, reference laboratories (labs), and pharmacies. 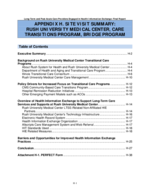 Adopting CEHRT, particularly systems that meet ONC defined certification requirements for exchanging clinical care summaries at transitions of care, is one important step towards supporting care coordination through more efficient HIE. Beyond implementing certified EHRs, the EHR Incentive Programs encourage providers to use their EHRs in ways that positively impact the care of their patients. Thus, HIE is a key focus in MU Stage 2 and beyond, and the Stage 2 criteria place an emphasis on HIE between providers to improve care coordination for patients. One of the core objectives in Stage 2 of the EHR Incentive Programs requires eligible providers who transition or refer a patient to another setting or provider provide a summary of care record for more than half of these transitions of care and referrals. 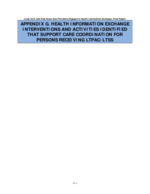 Additionally, MU Stage 2 includes other new requirements for the electronic exchange of summary of care documents. Stage 3 MU requirements are expected to include new requirements to support the interoperable exchange of additional content at times of transitions and referrals. 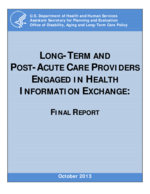 This report describes several initiatives around the development of standards to support the exchange of information to support care coordination on behalf of persons receiving LTPAC/LTSS. It also describes activities to advance EHR certification for technology needed by LTPAC providers. These efforts support the HIT infrastructure for HIE by advancing standards for documents, content, data elements, and privacy and security requirements. One of the central findings from this study is that the adoption of electronic HIE by LTPAC providers is just beginning, and interoperable exchange appears to be non-existent. 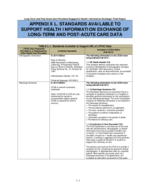 Available standards for key HIE requirements that are applicable to LTPAC providers and patients are identified in this report (Appendix L). Standards will be required beginning in 2014 as part of Stage 2 of the EHR Incentive Programs. 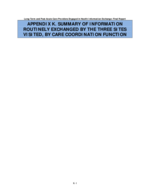 Standards are currently available to support the secure exchange of summaries of care, care plans, functional/cognitive status, medication reconciliation, laboratory test orders and results. However, these standards are not yet widely adopted. Over 25 HIE interventions that engage LTPAC and/or LTSS in HIE to support care coordination were identified in 22 states. Almost all of these interventions include electronic HIE. Most of these initiatives are through state HIE initiatives, and LTPAC/LTSS participation is through a state or community HIEO. 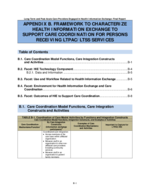 The care coordination and HIT frameworks were applied to characterize, describe, and better understand how HIE is used by LTPAC/LTSS providers for transitions, referrals in care, shared care, and other purposes. All of the identified interventions use some form of HIE to support care transitions. 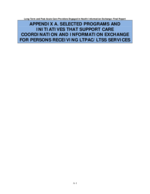 Key functions or use cases for HIE include preadmission assessments and referrals to LTPAC, discharges and transfers from hospitals to LTPAC, and transfers from LTPAC to acute care or home and community-based services or LTSS. 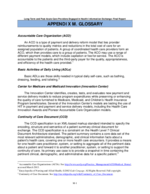 The types of information required to support transitions are complex and varied, and electronic HIE is typically supplemented with other means of exchange such as fax, paper, and telephone. In addition, some hospitals provide LTPAC provider access to the hospital EHR system which allows HIE. The most common type of electronic HIE to support care coordination was found to be point-to-point HIE during transitions from an LTPAC/LTSS provider (e.g., SNF) to a hospital or from a hospital to an LTPAC/LTSS provider, where information is electronically exchanged through secure messaging directly between providers. A less frequent type of electronic HIE is LTPAC staff querying and retrieving patient information from a HIEO repository that contains information from an exchange partner (e.g., hospital). HIE is often triggered by specific use cases and alerts, such as a change in patient or resident status that may result in a transfer to a hospital. 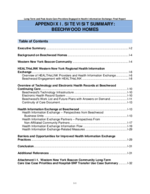 This study also identified interventions and tools that included an HIE component to support transitions between LTPAC and hospitals. These interventions included electronic/non-electronic (e.g., telephone, fax, paper) methods of exchange. An important gap in data at times of care transitions is the lack of current medication information to support medication reconciliation. For example, reconciling pre-hospitalization medications with post-hospital medications to determine the ongoing medication regime is difficult because complete medication history data are usually not available at transitions. Furthermore, HIEOs may be the primary source of a majority, but not all, prescription history data. Other identified gaps in information that, if addressed, could improve care transitions is the lack of information from LTSS and community-based providers such as the patient's home care environment, current and previous use of support services, and receipt of durable medical equipment, homemaker, and other services. Although use of HIE to support shared care is less frequent than in the case of transitions in care, there is an increasing focus on shared care and coordination of care across multidisciplinary health care teams and across provider settings for ongoing care. Shared care creates significant HIE opportunities for a variety of health care providers to support the assessment of ongoing needs and goals; develop and update the patient's care plan; monitor and respond to changes in the patient's status; and medication reconciliation and management.